Traveling worldwide as consultants provides numerous photographic opportunities to document natural and industrial systems. Along with profound beauty, there are hard and unpleasant lessons learned. One lesson is how lucky we are to live in America, and how rare and fragile our human state and opportunity are. Another, very unpleasant lesson is how little appreciation the average American has for this uniqueness. 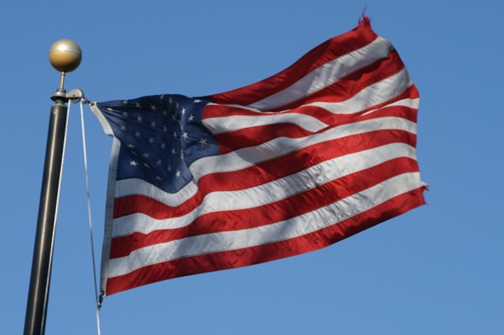 The American flag in the banner flies over Gettysburg National cemetery, where approximately 50,000 casualties occurred as soldiers from both the North and South paid the ultimate, bloody price for their beliefs. The graves of 3500 Union soldiers are testimony to the human desire for freedom. Today, Americans are perilously close to losing the freedoms many generations fought to perpetuate. In addition, the constant drain of competitive international power jeopardizes the great American experiment. This website promotes responsible government and condemns actions contrary to the Bill of Rights, Constitution, and the rule of law. In the early stages of the republic, the founders rejected elitism, placing the future in the hands of the people. The targets on this website may be Republicans or Democrats, and often both. Their actions and the metrics of their performance, determine response. Following are other lessons learned. 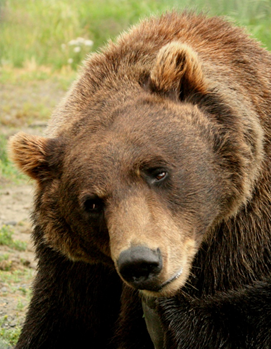 This brown bear survives a synthetic reality in an Alaskan wild life sanctuary, begging tourists for handouts. Keepers provide care, while the system determines its future. 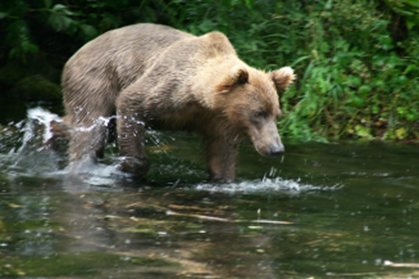 The second bear is wild and fishing for sockeye salmon. It is free, living without directions from controllers. The lesson learned is the similarity between people and other animals. People can exist in controlled environments, or be free to worship, or self-actuate. Freedom has value, and people must decide if it is worth the fight. For us, the answer is YES. Workers worldwide are concerned about supporting their families. Competitors work and study under demanding circumstances to achieve their objectives. Americans must obtain new skills, and then work hard for jobs, or survive like the first bear. 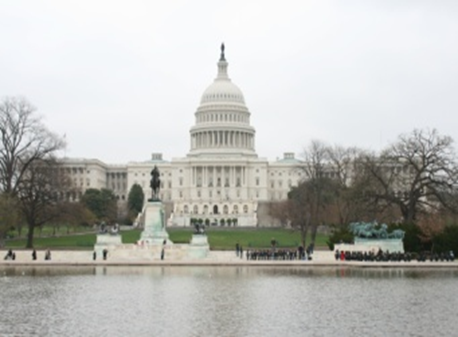 Exciting and beautiful, our politicians want us to believe that Washington, DC, represents the real America. Clothed in beautiful cherry blossoms, it is easy to buy into this false narrative. Plaquemine parish in New Orleans, flooded by hurricane Katina, provides an entirely different image. It remains largely unrepaired because the people are poor, black and lack political power. Juxtapose this image next to the one of Washington, DC. 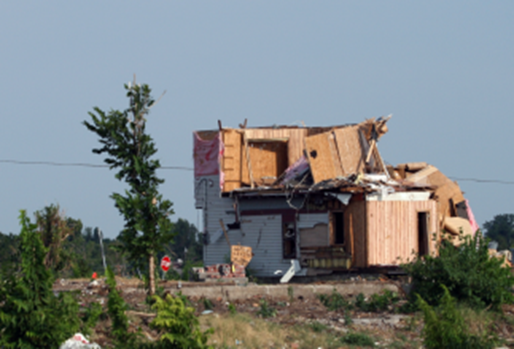 A tornado ripped through Joplin, Mo. Clearly, humans are not in control. Events do not go as planned. Nature is beautiful, but sometimes unforgiving and cruel - not by intent, but through the randomness of events. 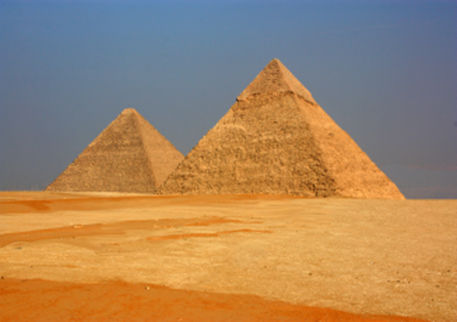 Egypt, once the most powerful, dynamic center of the world, is now a third world country torn by civil wars. The country is unable to sustain the welfare of its people. 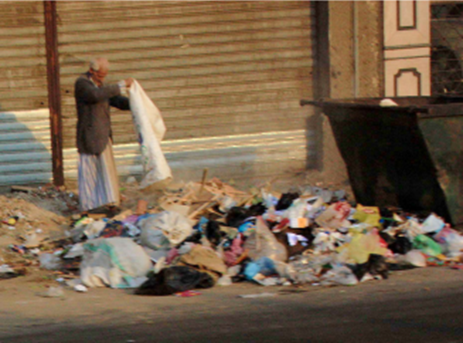 This Cairo resident dumps garbage next to an empty container. When economies collapse, the net sum game is operational, and necessity trumps basic environmental preservation. Americans foolishly believe it could never happen here. Look around at the empty factories, drive through the inter city. Serve at a food kitchen and see how people are living without jobs. When done, listen to the rhetoric about how things are getting better. Think about political correctness. Consider the constant reshaping and programming that result from a corrupted, political, press and education system. Ask why our factory system has fled the county. Ask why the greatest country ever on this planet is unable to generate jobs, educate its people, preserve its environment, and lead the way to a higher human state. 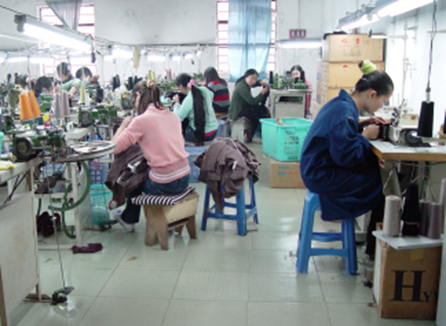 Extend the examination process into the factory and work place. There are ERP programs that marginally work, and Lean programs existing in name only. There is a constant intellectually dishonest rehash of concepts without relentlessly exposing and fixing the root causes for failure. Why? Where is the entrepreneurship, innovation, the fire of free enterprise? Many Americans have lost it, and millions buy in to the myth that capitalism is evil. We at Affinity Systems have not. This website is about fighting back against versions of false reality and priorities. We need to rebuild our factory system, provide jobs for our fellow citizens, clean up the environment, and sustain our freedoms. There is a plethora of books and information on ERP and process improvement. If the information is accurate and complete, why do many programs fail? We are angry that academia, political correctness, or fear of economic consequences prevents publishing the real reasons for failures. This includes false tradeoffs, project failure, distorted process improvement, how the world of nature really works, and our role in the ecosystem. We are confronting these issues with research, publications, and photography. 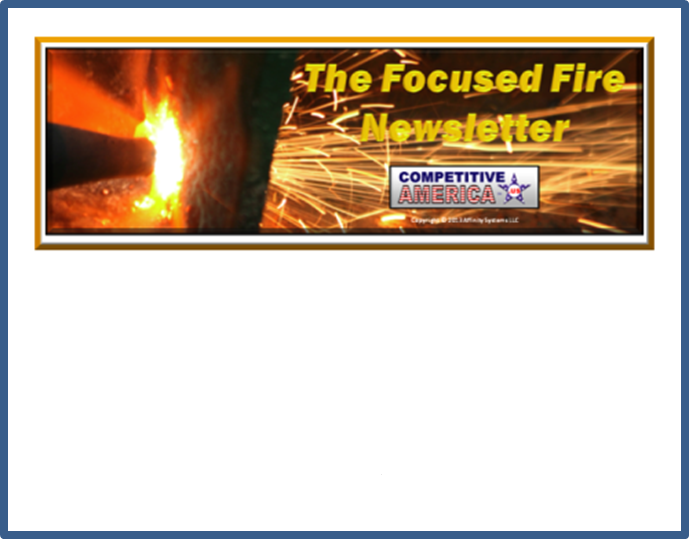 The Focused Fire Newsletter is a monthly publication, and the topics are not restricted. New books and essays are in process. These include a new process improvement method labeled ACTION, e-books on collaboration and setup reduction. "The New Great Wall of China," written eight years ago, will be updated, and available only on this website. Global competitors, however, are of secondary focus. Our greatest competitor is self-complacency and confused priorities by government, industry, and individuals. These are the targets for Competitive America. Sun Tzu was correct, " Know your enemy and know yourself and you can fight a hundred battles without disaster". The power of photography is the ability to tell stories, and used honestly, to help discover the truth. We also know that images on the dark side, propaganda, can program people into false or distorted views. Dozens of images accompany each one used. If readers desire more photos and less verbiage, tell us. "Old soldiers never die; they just fade away", is a ballad, but also a quote used by General MacArthur. 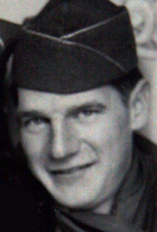 Unlike some old soldiers, this one is fighting to the end for God, family, and country. America must be as great for our children and grandchildren as it was/is for prior generations. Citizens deserve freedom from prejudice and unnecessary governmental regulation, and free to pursue opportunities. That is the path to America's resurgence. Freedom has never meant abdicating responsibility. We are stewards of our environment, resources, freedoms, and each other. Freedom is not free. It is hard work, the intelligent use of time, resources, and personal values. It is being there for our neighbor, our military and law enforcement, firefighters, and brothers and sisters in the trench next to us. It will take all of us to rebuild a Competitive America, and it starts by innovating the forth-industrial age, green and resource effective, led by American businesses.